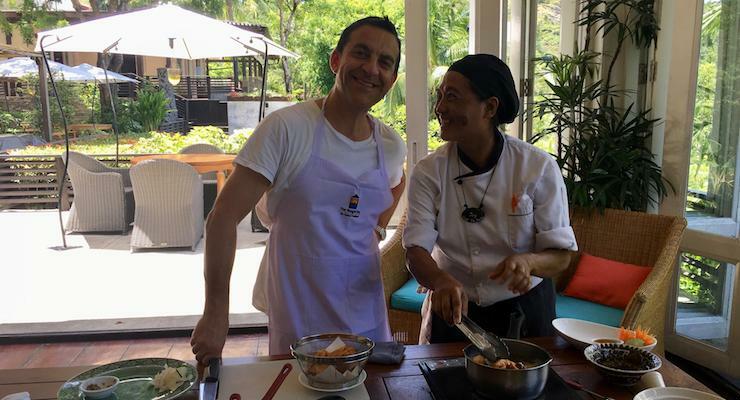 While staying at The Tongsai Bay (you can read my review of the hotel here) in Koh Samui, my family and I took part in an excellent Thai cooking class. 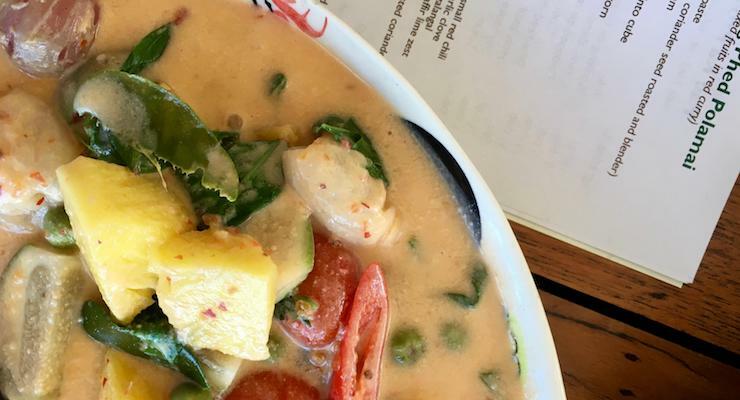 * We’ve experienced cooking classes a few times on our family travels, and they’ve always been a success – even when the kids are at peak teen-ness. And The Tongsai Bay class was definitely a success. The first part of the experience took place in the hotel’s organic garden (although the kids didn’t join us for this bit). 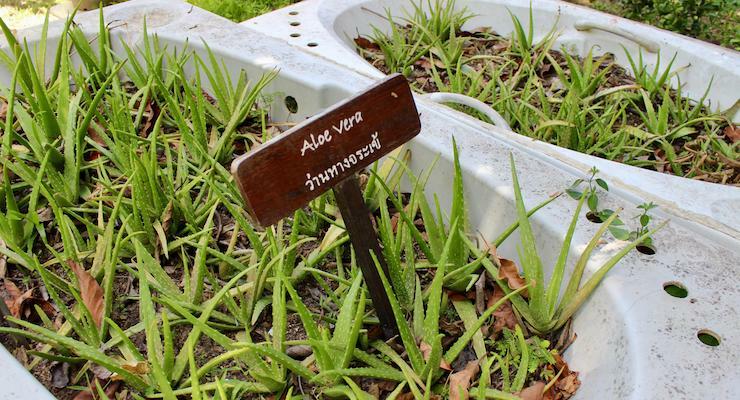 One of the hotel staff members, Hiro, took my husband and I to the garden and gave us a tour of the many herbs, vegetables, fruit, flowers and plants which are grown there for use in the hotel. Hiro also told us about The Tongsai Bay’s award-winning Green Project, where they work to protect the environment and minimise waste. It was intriguing to learn about the variety of innovative approaches involved in this plan. For example, they avoid using chemical cleaning products and so ferment kaffir limes to make toilet cleaner, they donate leftover food to a local animal rescue shelter, and they reuse excess building materials in creative ways around the hotel (I loved the lobby bathroom doors which are formed of small scraps of wood). They also organise beach cleaning expeditions for staff at neighbouring beaches (I suggested that guests may be interested in taking part in these). 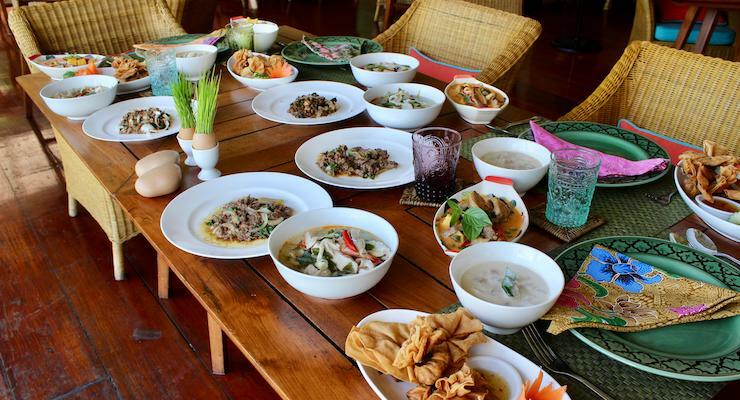 The cooking class took place at the airy and welcoming Chef Chom’s restaurant, where breakfast is served each morning. The four of us (the kids had joined us by this point) were the only guests taking part in the class that day. The class was led by chef Joy – an aptly-named, smiley, friendly Thai lady. Working with Joy were four other helpful Thai ladies to guide us. When we arrived, there was a big table laid ready in the restaurant with ingredients, utensils, and an individual table-top electric hob for each of us to use. Joy welcomed us and explained that we were going to make five courses. My husband and son would cook meat and fish dishes, while our daughter and I would make vegan versions. Joy gave us each a recipe booklet of what we were making, to use during the class and to take away afterwards. This is what we made. 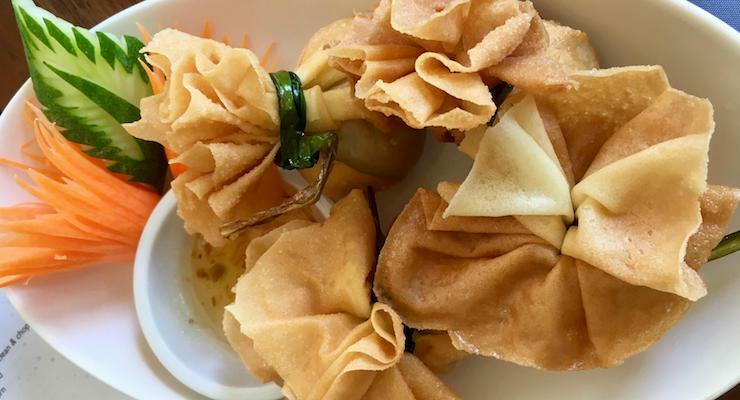 This dish consists of parcels of vegetables in spring roll pastry, deep fried. One of the vegetables that we used was taro, which I’d never heard of before, but it’s a root vegetable and is used a bit like we use potato. The pastry was ready-made and bought from the supermarket. The pouches were served with sweet chilli sauce, for dipping, and they tasted delicious. The non-vegan version of this dish was toong tong goong (deep friend minced prawns in golden pouch). This was easy to make, as it just involves boiling some stock and adding the mushrooms, herbs and spices. The soup was tasty but too spicy for me, so I’d go easy on the chilli next time. 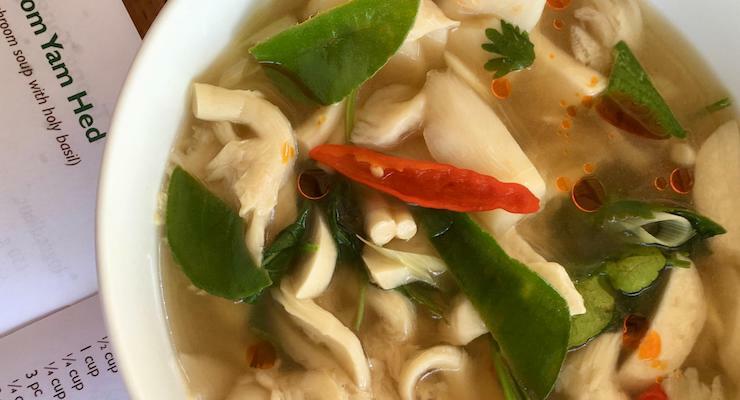 The non-vegan version was poh tak (spicy seafood soup with holy basil). 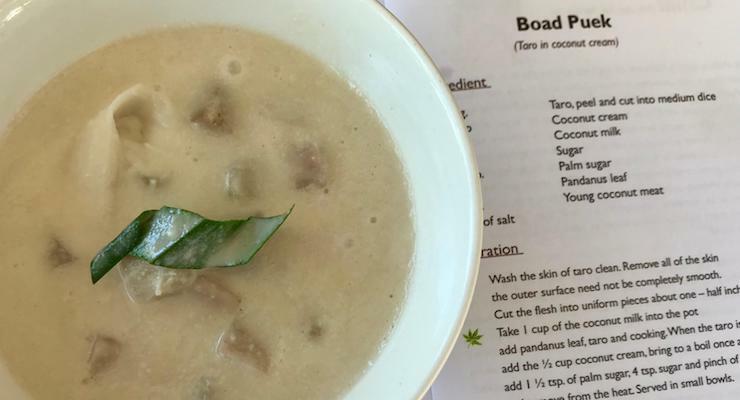 The concept of a fruit curry had never occurred to me before this class, but the combination of pineapple, lychee, curry paste, coconut milk and kaffir lime leaves was simply delicious, I have made it since, back home in the UK. The curry is very easy to make, and you can use any vegetables, fish or meat in place of fruit. The non-vegan version was geang phed ped yang (grilled duck in red curry with pineapple and lychee). This was stir-fried tofu and mushroom with chilli, garlic, onion, soy sauce and basil. It was too salty and spicy for me, and I couldn’t eat much of it. I need to make a less salty version – possibly with vegetable stock instead of soy sauce. 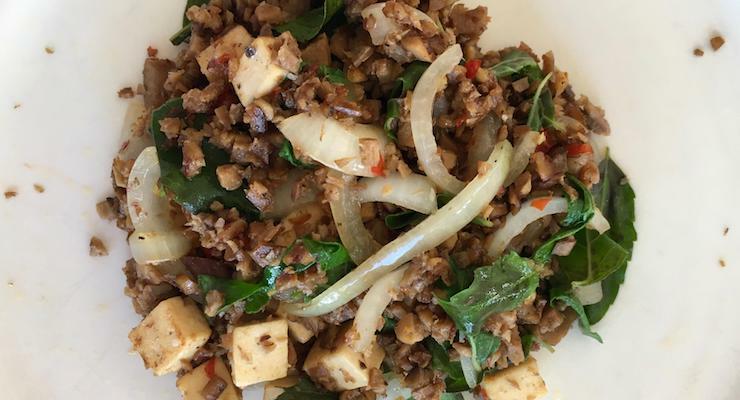 The non-vegan version was pad ka prow nua (Wok fried spicy tofu with holy basil). This dish of taro cooked with coconut milk, coconut cream and sugar is creamy, sweet and probably very tasty, but I was too full up to appreciate it after eating the other four dishes. Once we’d finished cooking, chef Joy presented each of us with a certificate and a Tongsai Bay apron. She’d taken a shine to our 15 year-old, and said that he was like her son, which was very sweet. While we’d been cooking, the staff had been placing our creations on a table laid ready for us to eat together for a late lunch. I don’t think that I’ve ever cooked a five-course meal before, and I couldn’t quite believe that we’d all managed it (although we did have a LOT of help from the kind and patient Thai ladies). It was an enjoyable and tasty meal, but sadly we were too full up to eat all of it. The hotel staff were very kind and patient with us during this experience. It was interesting to visit the garden, I enjoyed the cooking class, and it was good to be given the recipe booklets to take away. My favourite dish was the red curry, and I’m pleased that I’ve made it since at home. The cost of the class is reasonable as it includes the experience as well as eating what you cook – we ate ours at lunchtime and were then too full to eat anything else that day. 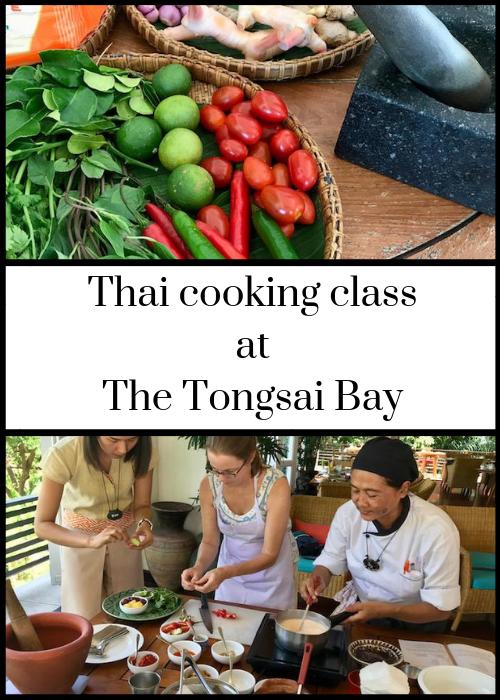 The Tongsai Bay Thai cooking class is open for all guests to sign up to, and is advertised in the ‘What’s On Weekly’ leaflet which is left in all guest rooms. The cost is 2,500 Baht per person (around £58), including the garden tour, a recipe booklet, a Tongsai Bay apron and eating the five-course meal which you prepare during the class. The cooking session took one and a half hours, and the tour of the organic garden took an hour. 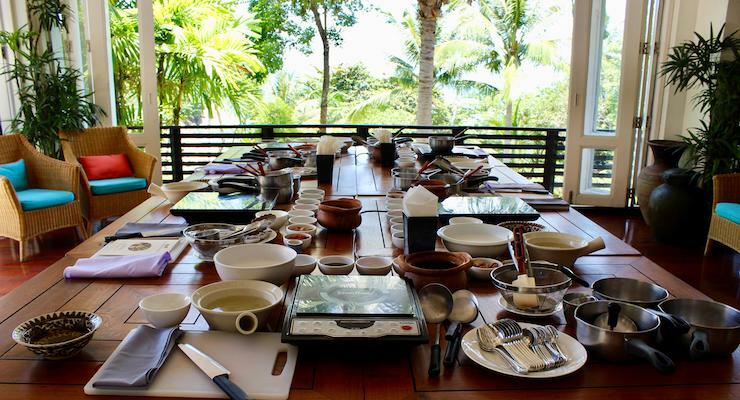 *Disclosure: We were invited by The Tongsai Bay and Kuoni to take part in the Thai cooking class for review purposes. This post contains some affiliate links, which means that if you clicked through and booked I may receive a small commission. All opinions, words and images are my own and are completely independent, as ever.